Its name comes from the Persian language "lazur" which means "blue" and "lapre" meaning "stone". It is one of the oldest precious stones known and used by man. 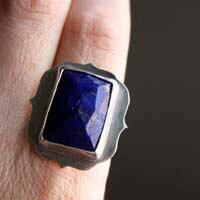 It was only named lapis lazuli from the Middle-Ages period. 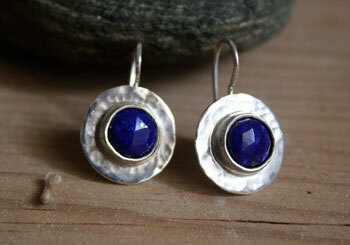 Before this, this stone was often confused with sapphire. This mistake explains the numerous confusions due to a bad translation in the Greek and Egyptian texts, as well as in the Bible. 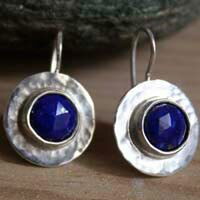 What is translated as sapphire in the Old Testament is more probably lapis lazuli according to the local geology. This stone is a rock composed of different minerals such as lazurite, calcite, sodality and pyrite (the gold of crazy people). It is more particularly the quantity of calcite one can see as white traces that determines the price of the stone. It is indeed considered as a default. 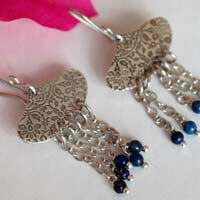 The lapis lazuli stones that show fewer traces are the most expensive ones. Almost all the lapis lazuli that was used during the antiquity period in Asia and Europe would come from mines located in the mountains of Afghanistan. They are still excavated the same way it was 2000 years ago. In America, Incas and other Pre-Hispanic cultures started to excavate mines in the region of Chili about 2000 years ago in order to make masks and decorations. This stone was often considered as a representation of the starry night by Pre-Hispanic civilizations. Egyptians and Sumerians used this stone to make masks because they would consider it was a symbol of purity. In the Sumerian time, people would think that it would prevent from dangers and therefore, it would protect them. People started to use it as soon as 3800 B.C to make jewels, amulets, decoration. In the Gilgamesh legend, this stone is quoted a lot. It was also the stone of the goddess Inanna. She would travel in the underworld and she was in charge of counting the days of life left to each person. Egyptians used to use lapis lazuli to make jewels, vases and little dolls, but also in makeup (more particularly on eye lids). It is found a lot on furniture and paintings. A good example is the sarcophagi and the mask of the Pharaoh Tutankhamen. During the Greek antiquity, the "sapphire of the old people" was well known. This stone was the symbol of the goddess of war and wisdom. This stone was also the stone of Hera, the goddess of wedding and queen of all the gods. Roman people used to give it aphrodisiac properties. It was the stone of the goddess of love, Venus. Celts also knew about this stone and would associate it with the river goddess, Dana. 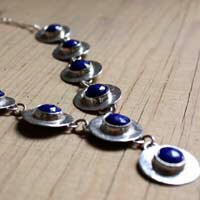 In the Islamic orient, the lapis lazuli was considered as a protection against the devil. Hebrews thought this stone was the symbol of the sky and that the pyrite golden traces you can find in this mineral would symbolize the sun. This is the reason why some bible specialists think that the Ten Commandments of Moses were sculpted on lapis lazuli. As said earlier, it was often confused and translated by the word "sapphire" that you cannot actually find in this part of the world. It is possible that it was one of the stones of Aaron’s armor and therefore, one of the symbols of the twelve tribes of Israel (and not the sapphire stone). Generally, and more particularly during the Middle-Ages, the powder of lapis lazuli was mixed with milk and it was used as a plaster to relieve ulcers and injuries. It was meant to strengthen bones. The mineral dust, which is called Azurite or Lazurite, gives a blue pigment that was well known by the Renaissance painters for its longevity. By mixing lapis lazuli powder and oil, you would get the famous ultramarine color. Leonardo Da Vinci and Albert Durero would call this pigment the "blue gold". In the Middle-Ages and the Renaissance period, this pigment was as expensive as gold. Nowadays, it is still used in jewelry. Chili is the main exporter of this ore.
Lapiz lazuli stones were very often sculpted. The treasure of the French crown owns a lot of stunning lapis lazuli objects such as a lapis and pyrite cup that was offered to Louis the 16th and a huge plate made of this material. Mines: Afghanistan, Chili, Russia, USA and Italy. The lapis lazuli would strengthen the immune system, the throat, the thymus, the thyroid, the back spin and the Eustachian tubes. This stone would help to avoid diseases, to repair muscles, broken bones and fractures. It would attract glory and fortune. 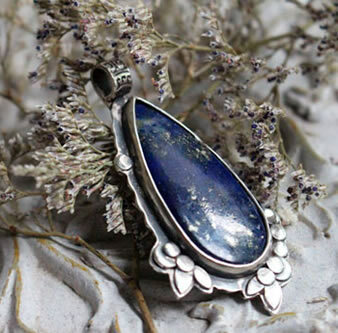 The lapis lazuli would help to cure insomnia and would help in the inflammatory process and infections. It would be useful in kidney and intestine problems. It would purify the respiratory system. It would also help to get rid of bad habits, addictions and obsessions. 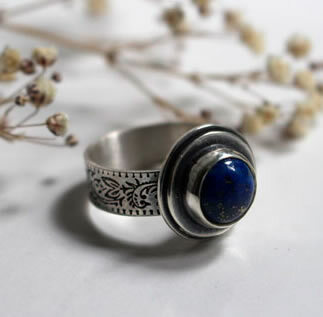 The lapis lazuli would reduce vertigos and would help to lower the blood pressure. After exposing it to the sun, it would be a good medicine to cure bruises, skin problems and insect bites.